Please note that all of our "Splash" fabrics were previously known as "Paint~Pot"
Please note that even when using Blackout Fabrics, the INTU and Perfect Fit systems are not considered to be "100% Blackout". Our Perfect Fit Roller blinds are part of our large collection, which include a mix of exciting new fabrics and designs which are specially selected to compliment any room in your home. From blackout Perfect Fit Roller blinds to sheer Perfect Fit Roller blinds we have the blind for you. All our hand-made Perfect Fit Roller blinds are chain operated or spring operated (child safe) and individually made to your unique choices, offering you the optimum in shading and privacy, night and day. You have a full choice of designs, bottom bars and colours making the choice totally yours. Please note that images are for illustration purposes only and may not exactly represent the actual fabric, it is always advisable to order a sample before purchasing. ENERGY RATING: ER1 possible savings off your annual energy bill15%. BLIND Perfect Fit Roller TUBE BOTTOM BAR: 100% slotted aluminium tube and bottom bar. CHILD SAFETY: All our Perfect Fit Roller blinds are classified as 100% child safe with no cords whatsoever. When measuring for Perfect Fit Roller Blinds, you need to open your handle slightly and measure the distance between the handle latch and the face of the frame. The clearance needed is 12mm, if you have less than this then the handle will catch the frame making it difficult to open your window. 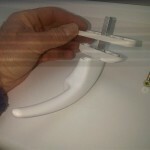 There are 2 sizes of handle spacers 2mm and 6mm. This is the distance that the handle will be projected out from the window frame allowing space for the Perfect Fit Frame. First of all you need to undo the two retaining screws on your handle, these maybe under a small sticky pad cover. You will need to partially open the handle to gain access to one of the screws. 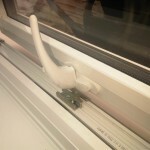 Once removed just pull the handle away from the window. Place your spacer over the square bar through the centre hole of the spacer. 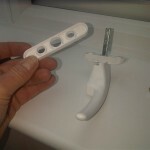 Now simply replace the handle and re-fit the retaing screws, your handle will now pass over the Perfect Fit frame with clearance. Perfect Fit Blinds presentation by Direct Order Blinds, the home of made to measure blinds. See how Perfect Fit Blinds work and how they fit into your windows, doors or conservatory.